How can you give your favorite dish a modern and fresh twist? 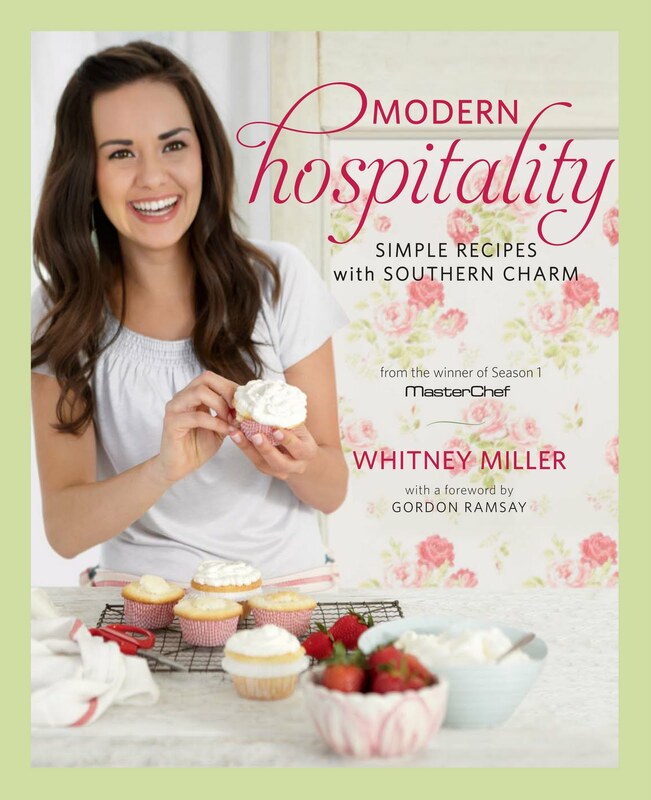 In my cookbook, Modern Hospitality, I take Southern cuisine and put a modern, fresh twist on it. My passion is to inspire others from kids to adults to get in the kitchen and have fun cooking. Recipes like my turnip green pesto, bacon-wrapped stuffed brussel sprouts, and crispy coconut bites (grits for dessert) are creative ways to use common ingredients. I hope they inspire you to want to try and cook them. How can you give it a modern and fresh twist? I want to answer this question for you. Submit in the comment section of this post, what your favorite dish is and why you would want me to put a modern and fresh twist on it. (Include the name of the dish and the recipe) I will choose one dish and create an original modern and fresh recipe of the dish just for you! You have until next Friday to submit your recipes. I can't wait to hear from you! In my family, birthdays are always a special occasion. My favorite part is that you can decide where you want to go eat on that day. This was always a very special time for me because I could choose an expensive restaurant because this was my birthday present from my parents. For my 17th birthday, I was an Emeril fan and so I wanted to go to his restaurant Emerils in New Orleans. I loved the experience! I even had the chance to tour the kitchen which I was so fascinated by. For my 18th birthday, I went to the Royal Sonesta's restaurant in New Orleans for their Sunday brunch. This place became a favorite birthday spot for my other family members as well. I could have skipped the breakfast/lunch items and could have dove into the desserts right away. The presentation of the desserts is what fascinated me. I especially loved their banana fosters, eclairs, and pecan pralines. Ok so enough about me. My dad's birthday was yesterday and I asked him where he wanted to eat for his birthday, in the back of my mind I already knew his answer. He told me that he wanted me to cook for him. Me- What do you want me to cook? Me- Ok but that can't just be the meal. (He loves these things and I never make them.) I will do that for an appetizer. Dad- You are the Masterchef. Surprise me with the rest of the meal. So, I call my mom. Me- Mom what do you think dad would want for dinner. Mom- He loves to order steak when we go out to eat. Luckily I am in Hattiesburg because my small town does not offer filet mignon in its grocery stores. I go by the Lil' Butcher Shop and pick up my dad a 10 oz. filet and also 2- 8 oz. filets and a 5 oz. filet. I decided to marinade the filets in my Miracle Marinade (recipe found in my cookbook- Modern Hospitality: Simple Recipes with Southern Charm). I let them soak for a hour in the refrigerator. I then pat them dry so that I could get a good sear on the filets. You want to make sure you begin with a hot grill pan. (I used a Lodge castiron grill pan. I found it for $20 at Target) I preheated my pan on medium-high and drizzled canola oil in the pan to coat the bottom. Sear each side of the filets for 2-3 minutes, depending on thickness. I then put the grill pan in a preheated 400 degree oven. Again the cooking time depends on the size and thickness of the filets. For the 5 oz. filet, it took about 4-5 minutes. This produced a medium filet. To serve the filet mignons, I caramelized onions and sauteed baby bella mushrooms. He was a very happy man. I might as well have put a candle in his filet because he was too full for birthday cake. My mom volunteered to make my older sister, Leslie's baby shower cake. Decorating cakes is one of my mom's many creative talents. It seems as though anytime my mom makes and decorates a cake that she ends up spending several hours working on it. These hours usually range from 9:00 p.m. to 3:00 a.m. I can be found with my hair "on top of the world" (a high pony tail) with her in the kitchen. After hours spent in Babies "R" US in Mandeville, LA shopping for and testing strollers and car seats, we made the long trip home. That long trip included having to go over the never ending Causeway bridge (Guinness World Record for longest bridge over continuous water in the world at 23.83 miles). My mom and I brainstormed on how we could decorate the cake without spending hours doing it. Have you been there before? "Mom what about making chocolate decorations instead of using fondant, which would take forever to do" -me. This was the best idea if I do say so myself. To add to the cake decorations, I made animal cupcakes. For the lion cupcake, I used the #233 decorating tip to make their orange mane and a Wilton chocolate candy for their face. For the monkeys, I topped chocolate frosting with a tan chocolate candy for the monkeys' faces then piped white frosting eyes. For their tail and ears, I filled a zip top bag with melted chocolate and snipped the corner. Then piped tails and ears onto wax paper. Using a toothpick, make a hole in the cupcakes and insert the tails. My gift to my soon-to-be nephew. He will love his Aunt Whitney! I love my sisters and my mom! There may be a little friendly competition between Brittyn and I on who will be the favorite aunt. Ha ha! What to pack in your kids lunches? It wasn't too long ago when I was fixing my own lunch for school. My parents both worked at my town's high school, my mom an English teacher and my dad a coach/athletic director. Since they were running around like myself to get ready for school EARLY in the morning, my mom gave the responsibility to my sisters and I to prepare our lunches. My mom was always concerned though that we ate healthy. She would buy us fruit, cheese, and other things to pack in our lunchbox. Sometimes my younger sister, Brittyn's fruit wouldn't get eaten but rather she would sell it to her friends. Ha ha! She was a little entrepeneur at a young age. I definitely know she is in a good field with majoring in marketing. So with the start of school, I want to share with you a few modern Back-To-School lunch options to pack in your kids lunchbox. Let your kids play with their food! Yes, I did say play with their food. With my vegetable skewers, you can skewer on vegetables and cheese. I know what you are thinking. Danger! Skewer? This skewer is edible. By cutting thin sticks out of broccoli stalk, you can make the perfect skewer. Broccoli stalks really work great and taste good because they are sturdy and have a neutral flavor. I have skewered cherry tomatoes and mozzerella cheese onto my broccoli skewer. Broccoli stalks are also really good dipped in peanut butter. Now, when it comes to purchasing peanut butter, I want it to be healthy but also taste good. I don't like the kind where you have to stir in the oil. That kind of grosses me out. My favorite natural and flavorful peanut butter is Skippy Natural Peanut Butter. You can view the ingredients on the back and it list- peanuts, salt, and sugar. You have to have the little bit of sugar to give it the flavor of like Jiff but without the hydrogenated oils (bad stuff!). *Tip: spoon peanut butter into a zip top bag. Kids can tear a hole in the corner and squeeze out the peanut butter. What kid doesn't like chips? I like chips too but not the kind of chips you are thinking about. I make homemade sweet potato and green apple chips. These aren't your typical deep fried chips either but instead oven-baked until perfectly crisp. The secret is to use a pizza stone. 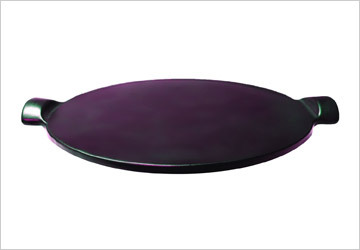 The pizza stone absorbs the moisture and makes whatever you put on it crispy. To make the thin slices, use a mandoline. Heat the pizza stone in the oven on 400 degrees. After 5 minutes, pull it out of the oven and place your slices on it. Lightly spray the tops with cooking spray. Bake for 6-8 minutes or until crisp. Sprinkle sea salt on top. Remove to an air-tight container or for immediate enjoyment, serve on a plate. Emile Henry Flame Pizza Stone is my favorite pizza stone. I want to share with you a way to purchase it at a special price. If you haven't heard of OpenSky, it is a shopping community of chefs, trainers, actors, etc. that want to share with others the products that we love. It is easy to follow me on OpenSky, all you have to do is go to http://t.opensky.com/TkT5omdj2c1NAAEG/TkOoIpxiiHQFdXIgA22b9 and click follow me. Then type in your email address and that is it! You won't receive tons of emails but every Friday I offer a product at a special price and you will receive an email about it. I hope your kids love these quick and easy snacks for their lunches! Share with me your tips so that I can pass them along to others.